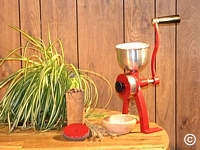 Manufactured in our factory since 1962, this mill is very easy to use and operate. It's die cast, tough aluminum alloy design is very light and durable. USDA approved powder coat finish allows it to be washed in a dishwasher. The shaft and auger ride on durable oilite bronze bushings. The stable two-wide stance bolt down leg design was intended for no nonsense motorization. Lifetime warranty for the original purchaser only. Free literature(owners manual) and live technical support for the duration of the warranty period. 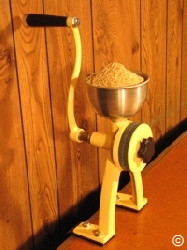 The Little Ark can be quickly adjusted by turning the knob to produce fine flour to course cereal. The body of the mill can be either permanently attached to a solid surface or temporarily clamped on to the table using a non-abrasive table clamp (Part Number RP-95). 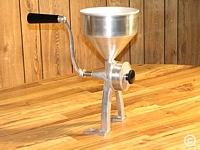 A 1-quart seed hopper is included with the standard unit. 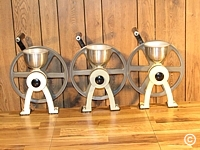 Larger size hoppers are available upon request. A motorizing kit is available. Shipped with ceramic stone grinding stones unless otherwise specified. If you would like to include both the ceramic and stainless steel grinding heads with this machine, please check the 16S model. You may also purchase the other grinding wheel at a later time. Both of the grinding wheels are fully interchangeable and can be switched within seconds. Dimensions: 14" high (with funnel), 7" wide, 12" deep. Grinding wheel diameter is 4". Shipping weight is 8 pounds. The shipping is free in Continental United States if you pay with a check or money order. Little arks will be shipped within one to four weeks depending on the color you select. The Uni-ark is a one piece die cast construction body. It is made with a high capacity, multi cavity, three-man operation hydraulic mold. That allows us to mass-produce hundreds of them in one day at a very competitive price. 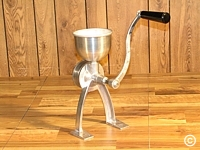 Because the grain hopper is incorporated as part of the body, this mill has it’s obvious limitations but nevertheless it is the ideal model for hand operation. It is also slightly smaller or compact then the Little Ark. 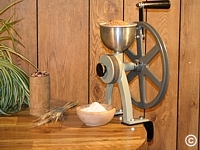 All the parts utilized in this mill (i.e. 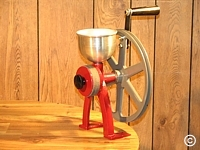 feed auger, grinding wheels, manual handle or the optional flywheel) are the same parts that used on the Little Ark. 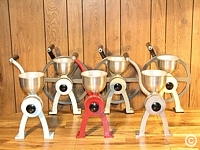 It's performance is also identical to the Little Ark.